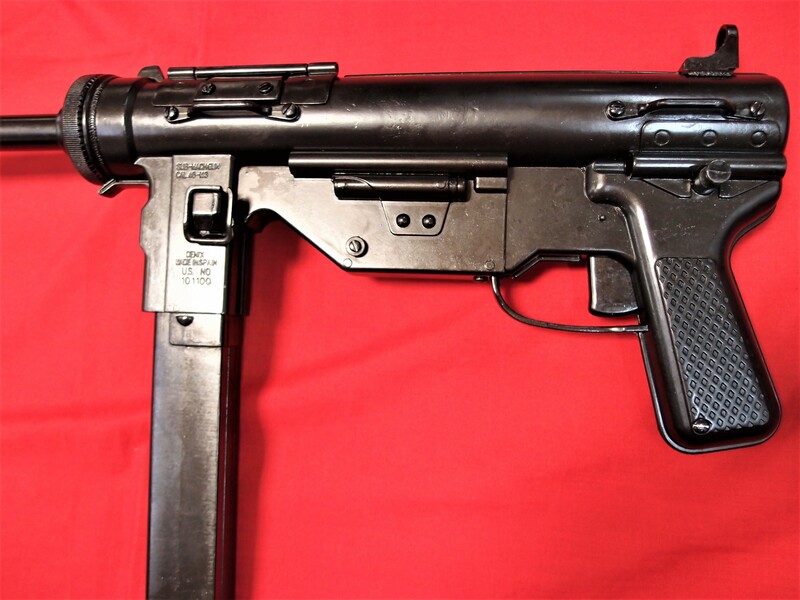 Offered is a Replica Denix M3 submachine gun Cal. 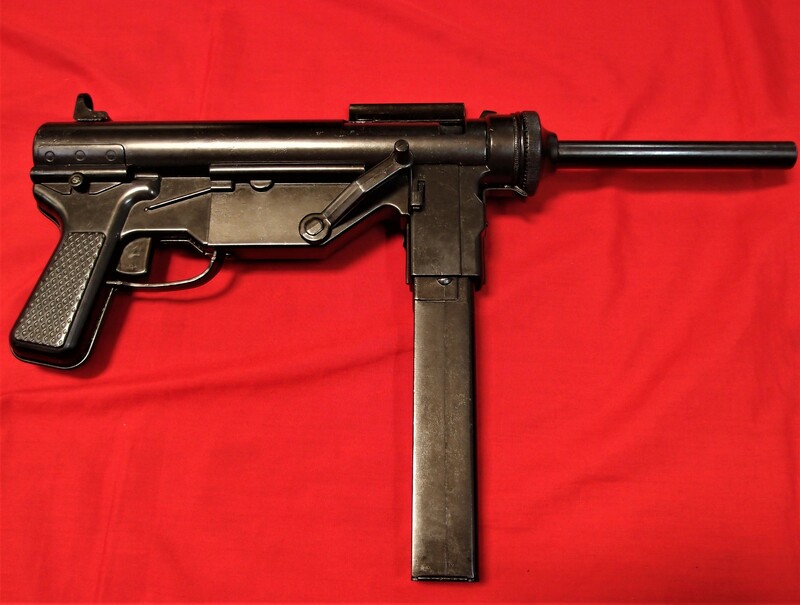 45 “Grease Gun”. 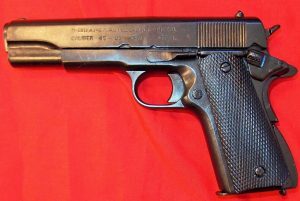 Features a cast black metal body, with simulated mechanism for loading and firing, moveable safe cover, removable magazine, quarter rotating cocking handle & firing trigger. No license required to own in Western Australia. 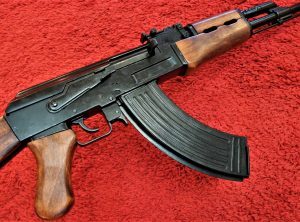 For other states, please consult your State Police Firearms branch for legal requirements to own. 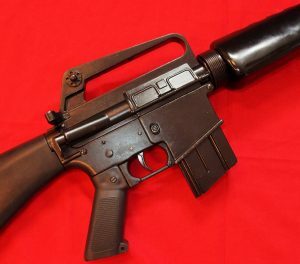 Whilst this replica can be cocked and ‘dry fired’, it cannot fire, nor can it be altered to fire live rounds. 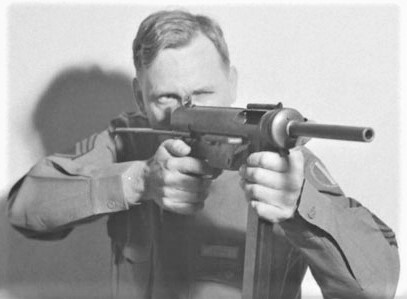 The M3 was an automatic submachine gun designed in 1941 by George Hyde, an experienced gunsmith in the German army during the First World War and who in 1927 emigrated to the USA. 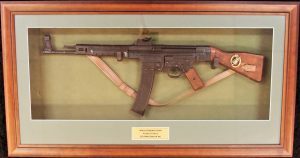 The weapon was commissioned by the USA Army because of the effectiveness of the European submachine guns such as the German MP, or the British Sten, and also because of the production and cost problems of the Thompson M1928A1. 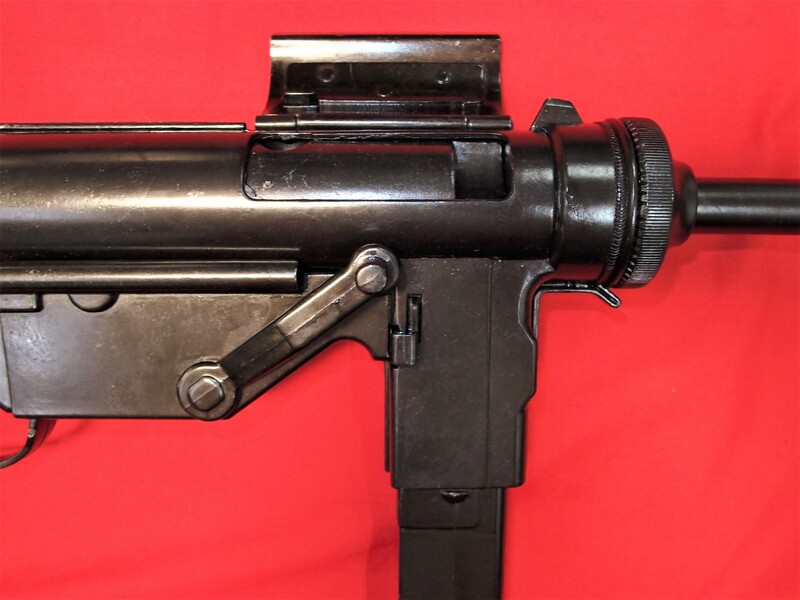 The aim of the M3 sub-machine gun was just the simplicity: it was activated by retraction of masses with an open bolt and firing bursts that were fed by a straight magazine with double row of ammunition with a capacity of 30 cartridges 45 ACP (11.4 mm). 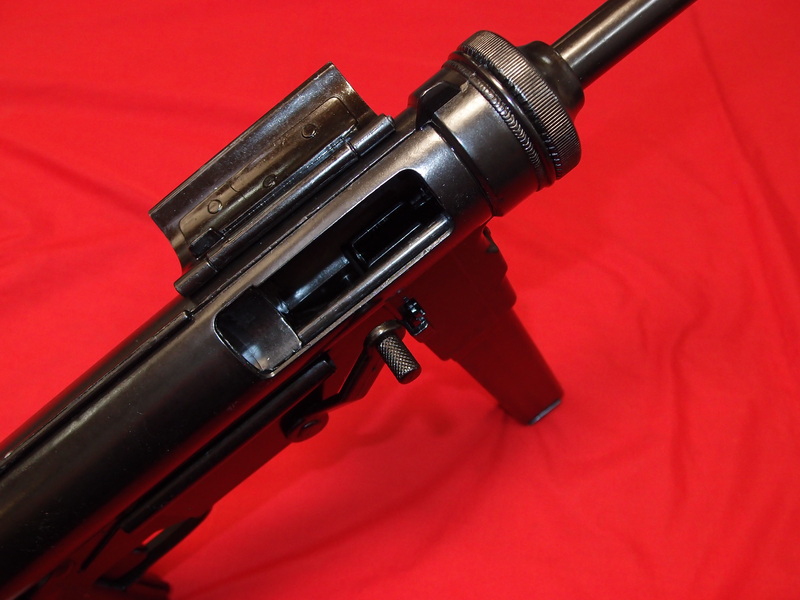 it was a completely metallic weapon that had a telescopic stock and an ejection window for the removal of the fired cartridges, which in turn acted as a safe against possible falls or blows that accidentally fired the weapon. Despite the problems in its manufacture, the M3 gained the sympathies of the soldiers and became popular as the “Grease Gun” (grease gun). This denomination comes from its resemblance to the pressure greasers used by mechanics in the maintenance of heavy war machines. 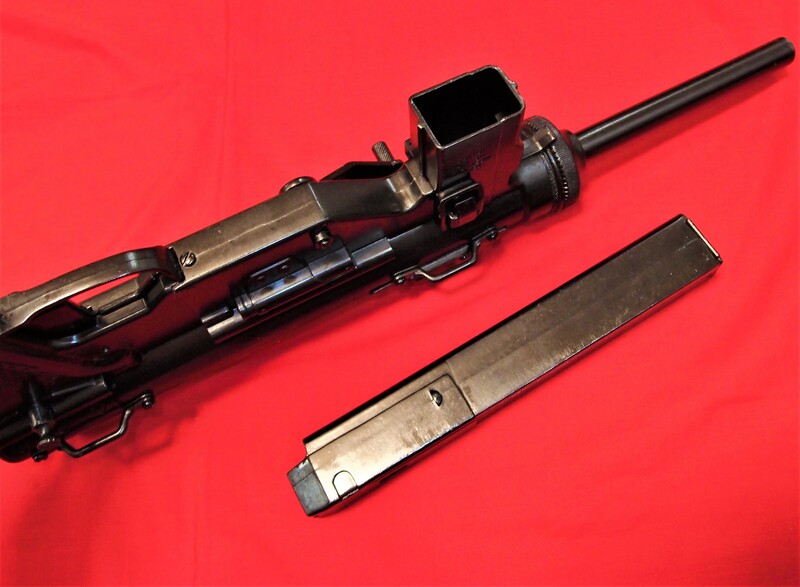 By the end of the war, some 600,000 units of the M3 had been manufactured. 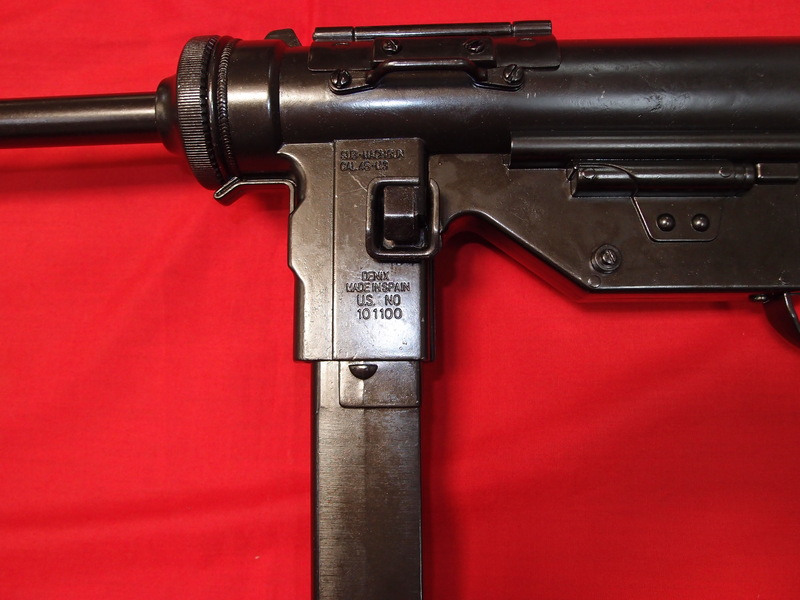 It was also used in the wars of Korea and Vietnam and it was active until the mid-1990s. 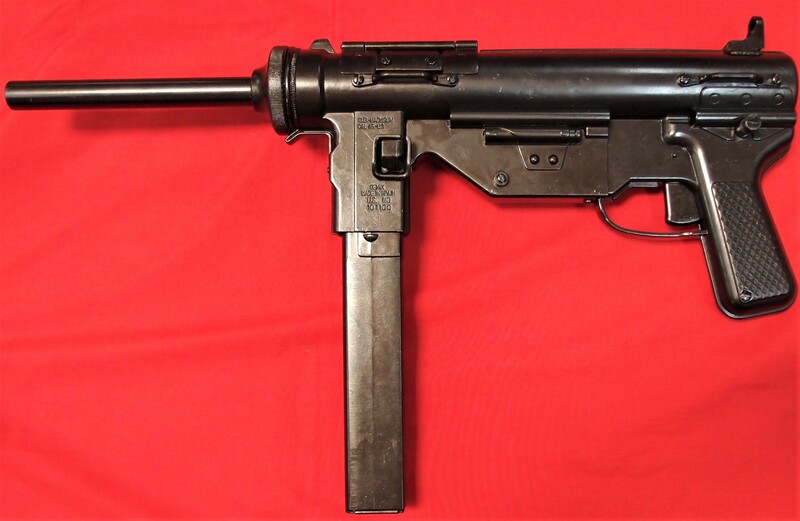 The Grease Gun entered into combat in 1942 with the US Army during the Second World War, a global military conflict that took place between 1939 and 1945, in which most of the nations of the world were involved, grouped into two opposed military alliances: the Allies of the Second World War (USA, USSR, United Kingdom and China among others) and the Axis Powers (Germany, Japan and Italy). It was the largest war in history, with more than one hundred million soldiers mobilized, and in which the great contenders applied all their economic, military and scientific capacity to the service of the war, erasing the distinction between civil and military resources. It was the deadliest conflict in the History, and resulted between 50 and 70 million victims. 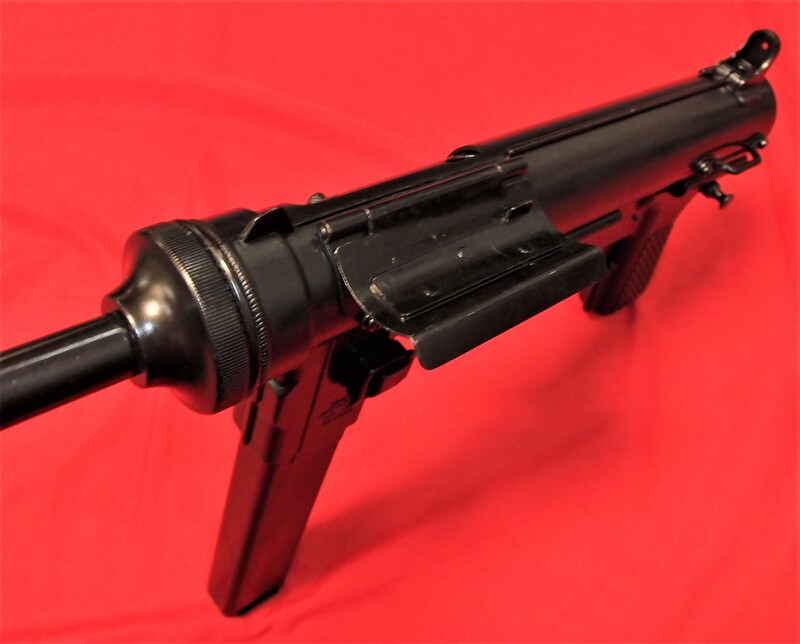 Recreate the most famous battles of the Second World War with the historical reproduction of the Grease Gun by Denix!